↑ A.H. Maslow, A Theory of Human Motivation, Psychological Review 50(4) (1943):370-96. ↑ Bob F. Steere (1988). Becoming an effective classroom manager: a resource for teachers. SUNY Press. ISBN 0887066208, 9780887066207 Check |isbn= value: invalid character (help). ↑ Hofstede, G (1984). "The cultural relativity of the quality of life concept" (PDF). Academy of Management Review. 9 (3): 389–398. doi:10.2307/258280. JSTOR 258280. ↑ Cianci, R., Gambrel, P.A. (2003). 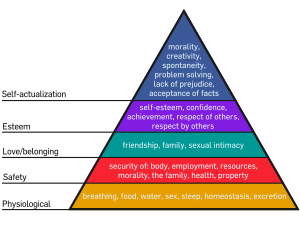 Maslow's hierarchy of needs: Does it apply in a collectivist culture. Journal of Applied Management and Entrepreneurship, 8(2), 143-161. ↑ Li, J., Lam, K., Fu, P. (2000). Family-oriented collectivism and its effect on firm performance: A comparison between overseas Chinese and foreign firms in China. International Journal of Organizational Analysis, 8(4), 364-379. A Theory of Human Motivation, original 1943 article by Maslow. Maslow's Hierarchy of Needs, Teacher's Toolbox. A video overview of Maslow's work by Geoff Petty. A Theory of Human Motivation: Annotated. Theory and biography including detailed description and examples of self-actualizers. Maslow's Hierarchy of Needs, Valdosta. หน้านี้แก้ไขล่าสุดเมื่อวันที่ 13 พฤศจิกายน 2561 เวลา 18:23 น.